See a cop in the mirror, real or not, here are some tips to help you during the traffic stop. Reduce you speed, pull to the right and stop in a safe location, and lower your window to listen to instructions. Turn on your emergency flashers and acknowledge that you see and will yield to the red light. If you observe two or more clearly marked police vehicles behind you with red lights operating, pull to the right and stop in a safe location. Continue driving at a reduced rate of speed until you can safely stop in a well-lighted, public location, preferably where other people are present. Stay in your vehicle and wait for the officer to approach your vehicle and issue additional instructions. If you are contacted by someone who you believe is impersonating an officer, request to see their identification/badge. You do not need to open your window to see a badge or ID. You should see a uniform, their duty belt and see and hear their police radio. Use common sense, if you’re suspicious call 9-1-1 on your cell phone to alert authorities. While infrequent, there are legitimate traffic stops conducted by unmarked local, state, and or federal agencies. While these types of vehicles can vary in make/model, in many cases you would still see at least one solid red light, a siren as necessary, in addition to the law enforcement officer displaying distinctively marked clothing, a badge, or other credentials. Once the officer positively identifies his/her self, comply with their requests. If you’ve been contacted or stopped recently by someone you suspect is impersonating a police officer, immediately contact your local Law Enforcement Agency to submit your tip. At LA County, we want to make sure the voices of our constituents are being heard. The LA County Board of Supervisors has directed County departments to develop cannabis regulations for the County’s unincorporated areas. That’s why THIS WEEK, the Office of Cannabis Management will be hosting public listening sessions so that citizens like you can express suggestions and concerns. Topics to be discussed include: Where can commercial cannabis businesses locate? What rules should these businesses follow? What strategies can help prevent youth from consuming cannabis? What strategies can enhance public safety? If you can’t make it to this week’s listening sessions, there are plenty more throughout the summer that you can attend. Click below to view the full schedule. These sessions are open to everyone. They will be conducted in a workshop style, and will be facilitated to encourage honest and open dialogue about this important issue. Translation services will be available. We hope to see you there! The public comment period for the Centennial Specific Plan project Draft Environmental Impact Report (DEIR) which was set to close on Monday, July 17, 2017, has been extended by 30 days to 5:00 P.M. on Wednesday, August 16, 2017. This extension thereby provides a total of 90 days to submit comments on the Centennial Project Draft EIR for consideration in the Project’s Final EIR. This is your chance to provide input on MTA’s long range transportation plan. In addition to the community meetings, we will be holding a series of telephone town hall meetings in May. The virtual nature of these meetings makes it easy for everyone in all parts of the county to learn more about Metro’s plan. It’s a great chance to ask questions of Metro board members and senior staff from the comfort of home. Each meeting is an hour long and there are two meetings per night, 6:15 p.m. to 7:15 p.m. and 7:30 p.m. to 8:30 p.m.
To participate in a telephone town hall meeting, simply select a convenient date and time and call 888-400-1932 for English and 888-400-9342 for Spanish. Here are some of the local State Park Activities scheduled for 2016. This year, conditions didn’t work out for the poppies. The wildflowers had barely gotten started in February for what looked like would be a moderate bloom, but rains didn’t come soon enough to carry them through and the bloom faded away before the season really started. The Jane S. Pinhiero Interpretive Center will be open daily through the end of April, and then Friday-Sunday 9 a.m. – 5 p.m through May before closing for the season. Although there are no carpets of flowers, there are 8 miles of trails with beautiful views meandering through the Antelope Buttes, and wildlife is seen more frequently without the crowds that big blooms bring. Arthur B. Ripley Desert Woodland State Park, a Joshua tree/California juniper woodland, is also a lovely park to visit just 7 miles east of the Reserve. ETI Corral 138 and the Support Saddleback Committee invite equestrians to come out and ride on Saturday April 30, to help improve Saddleback Butte State Park equestrian amenities. Recent improvements include installation of three new Step-over horse gates at the trail’s entrance and exit. Elaine Macdonald will lead a 9 mile ride (about 3- hours) on the horse trail, and around the back of Saddleback Butte to return to the staging area for lunch (served from 11 a.m. until riders return). The trail is ideal for beginner riders or young horses. Sandy terrain, with beautiful views of the Antelope Valley and the San Gabriel Mountains. Please RSVP to Elaine by April 30th to assure lunch: emac43031@gmail.com or 661-946-1976. Call for confirmation if rain is forecast. When: Saturday April 30th, Registration 9 a.m.; in the Saddle 10 a.m.
On Saturday May 7, 2016, from 6-9 p.m., join us for an encore performance of Owl and the Bear at Antelope Valley Indian Museum. The event is a fundraiser for the Friends of the Antelope Valley Indian Museum. Come out, enjoy theater under the sky, and support the museum. From 6 to 7 p.m., the museum will be open. Food will be available for purchase from 6 p.m. until 9 p.m, so you can enjoy dinner either before or after the play. The play will start at 7:00 p.m. After the performance, the museum will reopen until 9 p.m. The museum highlights American Indian peoples of California, Arizona, and New Mexico. The history of theater at the museum dates back to 1932. Museum founder H. A. Edwards wrote an Indian pageant. It was performed outdoors, near the museum, annually from 1932 to 1935. Edwards’ drama students from Lincoln High School played the main roles, and local friends and neighbors played the secondary roles. Edwards named his outdoor stage Theatre of the Standing Rocks. Tickets are $10 for adults and $5 for kids age 6 to 12. Kids age 5 and under are free. Advance tickets are on sale at the Antelope Valley Indian Museum gift shop every Saturday and Sunday from 11-4 pm. Remaining tickets will be available for purchase at the door on a first-come first-served basis on May 7. The museum is located at 15701 East Avenue M, in Lake Los Angeles, east of Lancaster, California. From the 14 Freeway in Lancaster, go east on Avenue K to 150th Street East. Turn right and go south for two miles to Avenue M. Turn left and go east on Avenue M for 1 mile to the museum. Please, no pets. For more information, phone the museum at (661) 946-3055 (711 TTY relay service), or visit our website at www.avim.parks.ca.gov. Join us on Facebook at www.facebook.com/AVIndianMuseum. 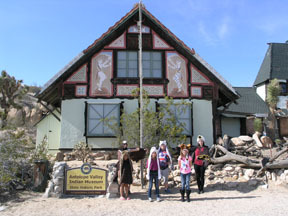 California State Parks is beginning the spring tour season at Tomo-Kahni State Historic Park in Tehachapi. Although no structures remain on this Kawaiisu Native American village site, the area’s rich history comes alive through the trained volunteer tour guides and the clues that the inhabitants left behind. Tomo Kahni means “winter home” in Kawaiisu, and rock rings mark the locations of many of the kahni, or homes, that were built of juniper boughs. Hundreds of mortar holes in the park tell of a very active past. The tour also includes Medicine Cave, Nettle Springs and a cave with pictographs- a spiritual place for the Kawaiisu. Due to the extremely sensitive nature of the site, the park may only be entered with an official guided tour. This season’s tours are offered Saturdays through June 11th. Activities begin at 8:30 a.m. with an orientation at the Tehachapi Museum and last approximately 4 hours, which includes travel time to the park (transportation is not provided). The tour involves a moderately strenuous 3-hour hike at over 4,000 foot elevation. Those with heart conditions or breathing problems should not take this tour. Weather is variable, so layered clothing is recommended. Ample drinking water, sun protection, and sturdy walking shoes are also necessary (no flip-flops, dress shoes, etc.). Tour fee is $5 for adults and $3 for children ages 6-16 (age 5 and under are free, but not recommended on tours). Tours are limited to 15 people and fill up fast so reservations are highly recommended, for an additional fee of $10 per party. To make a reservation or for more information, call (661) 946-6092 or email Mojave.Sector@parks.ca.gov. When: Saturdays April 16th through June 11th, 8:30 a.m. – approximately 1 p.m. Cost: Adults: $5, Children age 6-16: $3, Children under 5 free. Do you or someone you know have a trailer and love camping in the desert? We are looking for volunteer camp host(s) to stay at Saddleback Butte State Park, near Lancaster at the western end of the Mojave Desert (an hour north of LA). The host campsite has full hookups, and duties include greeting visitors and campers, selling firewood, light grounds maintenance, light restroom cleaning, weekend visitor center staffing and cleaning as needed, and opening/closing gates. It’s a small campground in a quiet park, but spring may be busy if we have a good wildflower bloom. Daily work hours depend on park visitation (but generally about 5 hours a day), and days off are flexible. Camp hosts can also be trained to give interpretive programs if interested. A small town and the State Park Sector office are located only 4 miles away. The 3-6 month position is available immediately. This is not a paying position, but hosts are compensated with a free campsite and hookups. Camp hosts must provide their own trailer or RV, and pass a background check. More info about the park can be found at http://www.parks.ca.gov/?page_id=618. Email Colin.Daxon@parks.ca.gov for questions or to receive an application packet. Today, Governor Edmund G. Brown Jr. proclaimed May 1-7 as “Wildfire Awareness Week” in California. Last year’s destructive Valley and Butte fires as well as the ongoing drought and vast tree mortality remind Californians of the fire dangers the state continues to face this fire season. Wildfire Awareness Week was kicked off at CAL FIRE’s Aviation Management Unit in Sacramento by Governor Brown with state and federal leaders. Governor Brown was joined by Cal OES Director Mark Ghilarducci, CAL FIRE Director Ken Pimlott, California National Guard General David Baldwin, U.S. Forest Service Region 5 Deputy Regional Forester Jeanne Wade Evans, and California Natural Resources Agency Secretary John Laird. State and federal officials not only discussed steps their respective agencies are taking in preparation of fire season, but stressed steps Californians can take to reduce their risk – such as having a disaster plan and kit, creating defensible space and heeding evacuation warnings. For more information on what you can do to be ready for this upcoming wildfire season, visit www.ReadyForWildfire.org. You can also find more preparedness tips in English and Español by visiting www.CalOES.ca.gov. To read the Governor’s proclamation declaring Wildfire Awareness Week, click here. The post California Kicks Off Wildfire Awareness Week appeared first on Cal OES Newsroom. Gold-Spotted Oak Borers, that appeared in San Diego County in 2002, which have killed approximately 80,000 oak trees to date. It has since spread, and appeared in our sister town council area of Green Valley. Slowing the spread will require great care and diligence on the part of residents and visitors to oak-forested areas. Do not take/use firewood from infected areas. Please see the GSOB information sheet and Field Identification Guide attached below. Please see the attached documents regarding the High Speed Rail Business Plan. The plan is over 100 pages, so be apprised of download time if your connection is slow. *Public comment will be taken at the regularly scheduled Board of Directors meetings on March 8, April 12 and April 21. The Final 2016 Business Plan will be adopted at the April 21 meeting. April 9th Free Trash Disposal Day, and April 23rd Free Tire Disposal Event, and more! The Angeles National Forest (ANF) is seeking input and requests your comments on a proposal to maintain many of the existing fuelbreaks located primarily on ridgetops within the Sierra Pelona Mountain Range north of the City of Santa Clarita, CA.